Apparently, I've Been Domesticated: Are You Vermicomposting? I have always been fascinated with the idea of vermicomposting. What's vermicomposting? Basically, it's like having worms as pets. You feed them your scraps and they produce worm poop, because, as we all know, everybody poops. Then you use that worm poop, a.k.a. vermicompost, as compost for your houseplants or garden. A great source of information, believe it or not is a little paperback book originally printed back in 1982 (back in 1982...ha! I was in elementary school back then...I am old!). Worms Eat My Garbage by Mary Appelhof is like the bible of vermicomposting information. Before you run out and buy the book, check your library (it makes me sad that libraries have become such an underutilized resource) or read this article she wrote on Mother Earth. I know some people are weirded out by the idea of worms in your home. Get over it. Bugs are everywhere, that's life. If you live in a warm climate, you can keep them outside. 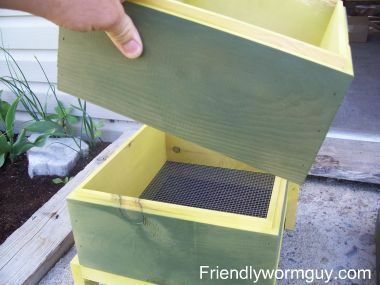 I've read some posts from people in colder climates that insulate the crap out of their worm bins, so they can keep them outside. Some people even repurpose old refrigerators to use as outdoor worm bins. The average person is not doing large scale worm bins, I don't plan on it. If I did, they'd have to go in the basement, where they would eventually get neglected. I feel like, if I'm going to do it and maintain it, then it needs to be somewhere I can see everyday. You can buy a worm bin, obviously. A lot of people do, and it seems a lot of people like the ease of these systems. The Worm Factory DS3GT 3-Tray Worm Composter is a very popular one, with a lot of good online reviews. You could also DIY it with a simple Rubbermaid container setup. Red Worm Composting has a lot of information that is pro-Rubbermaid worm bins. Personally, I don't like the cost of the commercial ones, nor am I into the plastic in general. It's not breathable and from I understand, harder to maintain temperature and moisture. Compost Junkie has some great info on why you shouldn't use plastic, and general vermicomposting information. But, to each their own. A quick search of the interwebs will show a slew of people that love their plastic bins, so do your research and decide for yourself. There are also a lot of people that love The Worm Inn . I could have sworn there was a video of how to use it from a very enthusiastic man on the site explaining the benefits, but it's not there anymore. I will say, but like the plastic bin set ups, a lot of people seem to love these too. Many have DIY'ed it with pants, but there have been people reporting mold issues. The non-DIY version is comparable in cost to the commercial plastic bins, and you have the option of buying or building a stand. I just don't think I want that in my kitchen, mostly because I think the Ninja Attack Cat will destroy it. I also think the DIY wood bins just look better. In the meantime, I thought I might build a box. I've been busily pinning things I've found. Ana White has one on her site...of course, she has plans for everything you can imagine and then some lol. But I liked this version on the Friendly Wom Guy's site. No building plans, but looking at the pic, I can figure it out. (There were more pics, but the site doesn't seem to be working now). I am still on the fence. We even went to a vermicomposting seminar, me and my tiny human. She took notes, and asked questions. I was so proud of her. I've been mulling this over for the past few years, but I think this is the year. And if you're looking for worms on a budget, my understanding is you can buy the right type of worms at Walmart in their fishing department. They reproduce quickly, so I wouldn't be concerned with buying a million of worms to start. You can also purchase them online, but read the reviews carefully. There are a lot of complaints with various companies, so do your due diligence finding a good source.